Customers who used our 4th grade STAAR WARS Math Task Cards loved them, and many teachers emailed us asking us for more. So we listened! But instead of creating more STAAR review sets, we thought it would be even better to have task card sets that could be used WHILE you’re teaching, instead of just to review afterward. This way you can measure learning as you go. So, we decided to create task card sets for every TEKS Readiness Standard for reading, math, and writing. 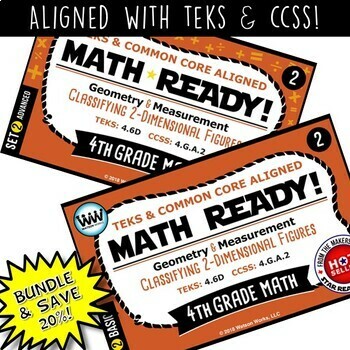 We will have 2 sets available for each TEKS Readiness Standard, a basic set and an advanced set, which allows the teacher to assess learning at various learning stages, making them perfect for differentiation. Instructions are included for 3 methods of review: task cards review in centers/groups/pairs/individuals, a SCOOT game, and a "Be the Teacher" game, but these cards can be used in a variety of other ways to meet your needs. 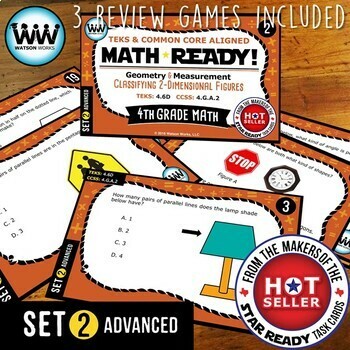 Follow us on TpT, Facebook, Instagram and/or Pinterest to be alerted when new MATH READY sets are added. Any time we add a new product, we offer it for 50% off for the first 24 hours after it is uploaded. Click the “Follow Me” button above to receive email notifications from TpT so that you can save! © 2019 Watson Works, LLC. Except as permitted under the United States Copyright Act, no part of this publication may be reproduced, stored, or distributed in any form or by any means (mechanically, electronically, recording, etc.) without the prior written consent of Watson Works, LLC. 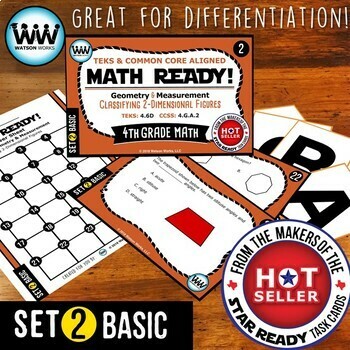 Purchasing this product in digital form from the Watson Works store on TeachersPayTeachers.com licenses one teacher to use this product in his/her classroom or for personal use. Additional licenses must be purchased for additional teachers to use this product. Made in the USA. All rights reserved.